Want to advertise on Magical-Menagerie? Jamie Parker (who plays Harry Potter) and other cast members of Harry Potter and the Cursed Child, today released a new film that explains how to win tickets to a special benefit performance of the hit play in New York on 23rd September 2018. Lumos announces the news that a second lucky winner will have the chance to attend a special benefit performance of six-time Tony Award®-winning play: Harry Potter and the Cursed Child. The prize includes roundtrip flights to New York from anywhere in the world and the opportunity to meet the cast. Lumos, J.K. Rowling’s international children’s charity is running the competition from 1st to 31st August 2018. Every $10 donation to Lumos at www.Crowdrise.com/CursedChild will count as one entry to the global sweepstakes run through the online fundraising platform CrowdRise. All funds raised on CrowdRise will go towards helping Lumos rescue vulnerable children from harmful orphanages and reunite them with their families. The competition runs from 1st August until 31st August 2018. The winners will be drawn the week beginning 3rd September and must be available to travel between 20th and 24th September 2018. Lumos has launced competition to win a magical weekend in New York, including flights and tickets to a benefit performance of Harry Potter and the Cursed Child on Broadway! Jamie Parker (who plays Harry Potter) and other cast members of Harry Potter and the Cursed Child, today announced the competition to win a pair of tickets to a special performance on 23rd September 2018. In a video greeting, the cast explain how fans can enter the competition which will benefit J.K. Rowling’s international children’s charity Lumos. Each $10 donation to Lumos equals one entry into the prize draw at www.Crowdrise.com/CursedChild. All funds raised on CrowdRise will go towards helping Lumos rescue vulnerable children from harmful orphanages and reunite them with their families. The competition runs from 1st August until 31st August 2018. The winner will be drawn the week beginning 3rd September and must be available to travel between 20th and 24th September 2018. Harry Potter and the Cursed Child is heading to San Francisco! The play opened in London’s West End in Summer of 2016, it came to Broadway in New York this Spring and will be opening in Melbourne, Australia in January 2019! Fans on the West Coast will get to see the play beginning in Fall of 2019 at the Curran theater! Performance dates, ticketing details and casting information will be announced at a later date. The nominations for the 2018 Tony Awards have been announced today and Harry Potter and the Cursed Child, Parts One and Two has been nominated for ten awards. The 72nd annual Tony Awards will take place June 10 at Radio City Music Hall. Sara Bareilles and Josh Groban will co-host. Rehearsals have begun in New York City for the Broadway production of Harry Potter and the Cursed Child! 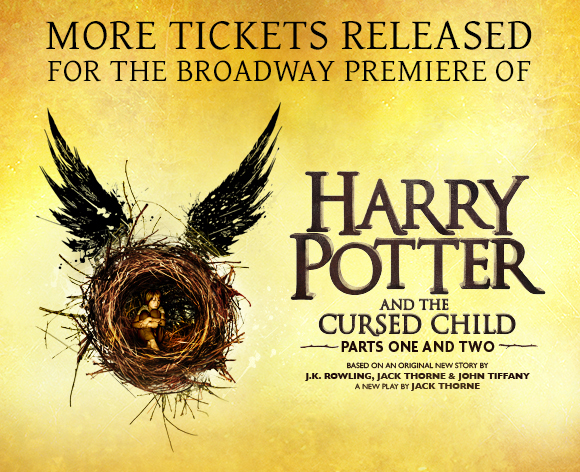 Previews for Harry Potter and the Cursed Child at the Lyric Theater in New York City begin on March 16th with the official opening on April 22nd. Anthony Boyle (Scorpius Malfoy), Sam Clemmett (Albus Severus Potter), Alex Price as (Draco), Jamie Parker as (Harry), Poppy Miller as (Ginny), Paul Thornley (Ron) and Noma Dumezweni (Hermione) from the original London production will be coming to New York. More tickets will be released on February 7th. For more details on how to get tickets check out this post! Harry Potter and the Cursed Child announced today that the next release of tickets will take place in February 2018. Once again, fans will have to register as a Ticketmaster Verified Fan to be able to purchase tickets. The pre-sale will be on February 7, 2018 beginning at 11:00 AM ET, to those who have registered and received an Access Code. For every performance of Harry Potter and the Cursed Child, there will be 300 seats priced at $40 or less per part, and 150 of these seats will be priced at $20 per part. Tickets at all price points for performances from March 16, 2018 to March 9, 2019 will be made available in the pre-sale via Ticketmaster Verified Fan®, a process that seeks to verify that ticket buyers are not bots or scalpers. Further tickets will be released as and when available from February 8, 2018 through the official website HarryPotterThePlay.com. The Verified Fan® registration period for the pre-sale will be announced soon. Those who completed the registration process for the first ticket release in October will need to register again in order to be eligible to receive an Access Code.